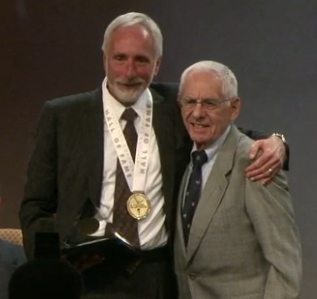 Vin Lananna, just retired coach of Oregon, just was inducted into the Track and Field Hall of Fame (which you can watch here). Giving him the award was Roy Chernock who also was the long time coach at W&M from 1978 to the early 1990s. Lananna gave a nice (short) speech even noting Chernock's 62 year marriage to Ethel. Chernock's first coaching job was at CW Post on Long Island which is he coached Lananna. Meghan McGovern will be representing Team USA junior squad competing at the North America, Central America, and Caribbean (NACAC) Cross Country Championships in Mandeville, Jamaica on Jan 26, 2013. Emily Stites will be resenting Team USA junior squad competing at the Bupa Great Edinburgh Cross Country Challenge in Edinburgh, Scotland on Jan 5. I'll put up more when we get closer. Okay so I am using new technology here on Hangouts on Google+ which actually worked fairly nicely. We spoke about the confidence needed to get All-American as a frosh for Emily Stites and to finish 13th in the US for Elaina Balouris. Thanks so much to Jason Schoener (writer), Emily Furia (writer and editor) and Harald Anderson (digital side).